As editor of this I’ve managed to sneak a story (Wedded Nightmare) and a poem (Below from Above) of my own in here. More importantly it showcases some of the round winning entries from the Slingink Scribbling Slam and a range of other writing by some wonderful writers. You can download (for free) or order on print as demand here. Well, I tried to reassure them all that I was OK and that this was not a true expression of how I was feeling. But having just taken stock and submitted a group of poems I have found 4, yes 4 which share this theme. The Gradual Loss of Me – written for the OUs A363 was about the sense of a loss of self and use of the form of a villanelle spiralled thoughts of loss down to its watery end. You can find a link to this on my Writing page. Son of Suicide – written for the OUs A215 was a response poem based on another poem we were given which had the prompt reference to suicide. You can find a link to this on my Writing page. My Brother – this unpublished poem written for the OUs A215 is my attempt to understand what might drive a suicide bomber – this is me using poetry as ‘making sense of the world’. Crumbled – written recently as part of Slingink Scribbling Slam 2010 was inspired by the images from 9/11 of people jumping out of the two towers. Images that are very hard to get out of your head. And also there is my work in which I have studied mental health disorders including suicide.This is a serious topic which is still fairly hush hush and maybe I’m just trying to make it visible. So what themes do you all find reoccuring in your writing? I have just submitted 5 poems and 2 short short stories to 3 different publishers (no duplicate submissions though – that’s just the total). Will let you know about acceptances or rejections. And I may send out some more. Decided to end 2010 as I want to go into 2011. Productive. 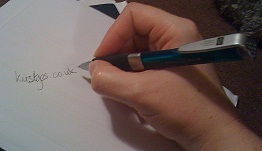 Have signed up to THE STIRRED POeT 2011 starting Jan on The Write Idea to help with this – a six round poetry competition. 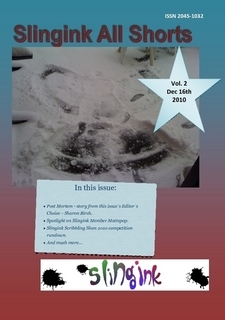 – a six round poetry and/or fiction compeition that I ran over on Slingink with masses of help, for which I am very grateful, from the two judges, for poetry Mandy Pannett and for fiction Nik Perring. Obviously I didn’t officially enter but I submited my poems (I managed 6 new ones) and stories (I managed 4 new ones and submitted 2 I’d previously written) anonymously for comments. I was so chuffed that I would have won one poetry round and come second in one fiction round so those are a couple of the pieces I have sent out today. I’m sorry to say that due to a manic end of work (which I am now not at for two weeks over Christmas) I’m behind with editing the second edition of Slingink All Shorts though I am determined to get it finished (ideally before Christmas, definitely before the end of December). Who else is on a mad submission rush at the end of 2010? In January I am going to look at my NaNoWriMo novel again. I’m already thinking of writing a sequel for NaNoWriMo 2011. I don’t think I mentioned that I have submitted a few stories to a charity anthology (Write to Fight) to support a fellow writer’s karate club. This should be out shortly so I’ll add a link to it when its available.